New to the world of video production and unsure what to buy? Our guide to the five best options in three software and hardware categories will get you started. Their A7 nearfield monitors received many plaudits, not least in the pages of SOS, but manufacturer Adam thought there was room for improvement. The Ableton controller race is hotting up — so how does the latest contender, the Akai APC20, compare to the competition? Does AKGs Chinese-made Perception 820 maintain the Austrian companys impressive reputation? Hear for yourself how this mic performed during the SOS tests. BIASs latest plug-in promises a quick and easy path to a modern vocal sound. GoPros HD Hero promises high-definition footage in the most inhospitable of conditions, so how does it hold up to punishment, and is it right for other video capture tasks too? Its their first analogue synth in 25 years, but is Korgs Monotron a toy or a tool? Theres no shortage of software guitar-amp simulators around, but Magix claim that their new Vandal has what it takes to stand out from the crowd. NI have updated Maschine — so is it now all we thought it could be? A good mic stand isnt the most glamorous addition to a studio, but its certainly a worthwhile investment. Steven Slates drum samples are already a staple of rock and pop production. Their latest product makes it easy to use these to augment or replace live drum parts. Tonehammer's Composer Bundle 1 comprises eight tuned percussion instruments. XILS Labs XILS 3 is a recreation of the EMS VCS3, but there's more to it than that — much, much more. We explore some side-chaining techniques using Live 8s Compressor. We show you how to easily re-use elements of older projects with Logics powerful import capabilities. Administration is a bore, but Cubase 5's Project Logical Editor can take the hard work out of keeping your projects tidy. Not only has the iPhone, star of the pocket-sized world, reached its fourth generation, but its desktop counterpart, the Mac Mini, has also had a makeover. These audio files accompany the Mix Rescue article that featured in SOS August 2010. Keeping your Pro Tools plug-ins up to date is vital if you want to maintain a reliable system — and now there's a helpful utility that will do it for you. Have you ever wondered exactly what goes on when classic hardware is recreated in plug-in form? Heres the full story from some of the industrys biggest names. Here are effects chain files for some of the multi-band processing setups described in our SOS August 2010 Reaper workshop. Our very first Reaper workshop explains how to use band-splitting to create your own multi-band processors. 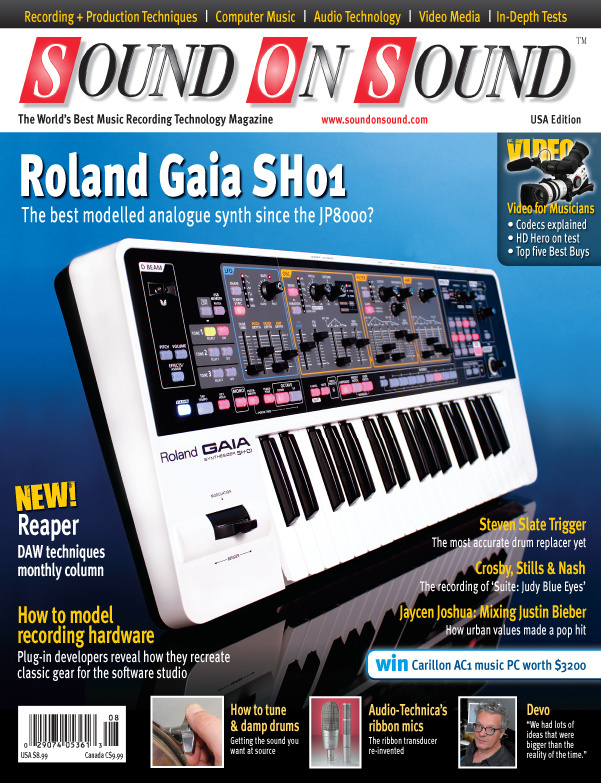 The SOS spotlight falls on the new toys offered by Reason 5 and Record 1.5. Building on last months introduction to the basics of scripting in Native Instruments Kontakt soft sampler, we explain how to make your scripted functions adjustable via a simple user interface. The SOS team tackle an assortment of problems, from computer error messages to boxy-sounding vocals. For most of us, compression is a necessity when capturing and editing video footage, but the range of codecs can be bewildering. Find out what you need to know with our in-depth guide. As the '60s drew to a close, David Crosby, Stephen Stills and Graham Nash came together to form a new group, the unique sound of which was perfectly demonstrated by their first recording, 'Suite: Judy Blue Eyes'. Pioneers of everything from circuit-bending to multimedia art, Devo have always belonged to the future. MGMT could have followed up their smash hit debut album with more of the same. Instead, they headed straight into left field, with help from a legend of British psychedelia. More readers' tracks get the Juke Box Jury treatment from the SOS crew. In his second career in the music business, Jaycen Joshua has become one of the USAs top mix engineers. With child star Justin Bieber, the brief was to bring urban grit to pop production. Why are vintage-sounding mixes desirable? Read more about Q. How can I prevent feedback? Q. How do the different amp classes work? Read more about Q. How do the different amp classes work? Q. Is there an easy way to match the gain of different channels? Read more about Q. Is there an easy way to match the gain of different channels? Q. Is working with digital recordings harder than working with analogue ones? Read more about Q. Is working with digital recordings harder than working with analogue ones? The musical challenges involved in composing for TV can be intimidating enough, but its the legal documents that are truly scary. Media content for the August 2010 issue.